Sebald scholar, Ruth Vogel-Klein of the Ecole Normale Supérieure, has sent me information on an extraordinary evening that she is organizing devoted to W.G. Sebald. It sounds like an event no one should miss! The evening will begin with the showing of a nearly unknown documentary film (50 min.) realized by Austrian Television in 1990 (in German, no subtitles). It shows Sebald’s presentation in Klagenfurt to the jury of the Ingeborg-Bachmann Prize. Sebald was one of numerous presenters hoping to win the prize, which was created to recognize distinguished young writers. After his lecture, Sebald comments briefly on his story Paul Bereyter from The Emigrants, and then the film shows the discussion of the jury. In despite of some very positive judgments on Sebald’s prose by some members of the jury, other voices won and Sebald was not selected. The film will be followed by a lecture (in German) by Sebald scholar Sven Meyer of Hamburg, editor of Campo Santo and Über das Land und das Wasser. Ausgewählte Gedichte 1964-2001. During the span of scarcely more than a decade, W.G. Sebald won numerous book and literary awards. Several of these awards have their own commemorative publications, which are challenging to discover and collect. Here is a list of the prizes won by Sebald along with information on the related publication if I own it. I welcome comments about any awards or award-related publications that are not mentioned here. 1991. Fedor Malchow Lyrikpreis for Nach der Nature. This prize for poetry is named after poet Fedor Malchow (1905-1978). 1994. Johannes Bobrowski Medaille (medal), Berliner Literaturpreis. Sebald was one of six Berlin Literature Prize winners in 1994. Bobrowksi (1917-1965), after whom Sebald’s medal was named, was a Russian-born German writer. [NOTE: As I learned from a comment below, Bobrowski was born 1917 in Eastern Prussia, then part of the German Empire.] 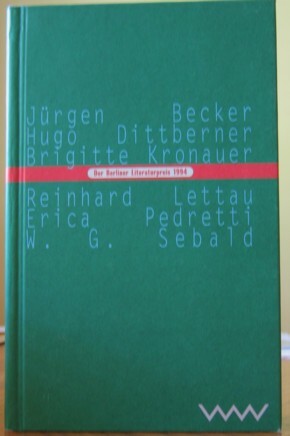 The associated publication, Der Berliner Literaturpreis 1994 (Berlin: Verlag Volk & Welt, 1996) curiously contains an excerpt from Der Ringe des Saturn titled Dunwich Heath & Middleton, even though that book hadn’t been published at the time of the award. It wasn’t published until 1995, the year between the award and the commemorative publication. 1994. Preis der Literatour Nord. 1997. Heinrich Böll Preis der Stadt Köln. 1997. Mörike Preis der Stadt Fellbach. A triennial prize awarded by the city of Fellbach. 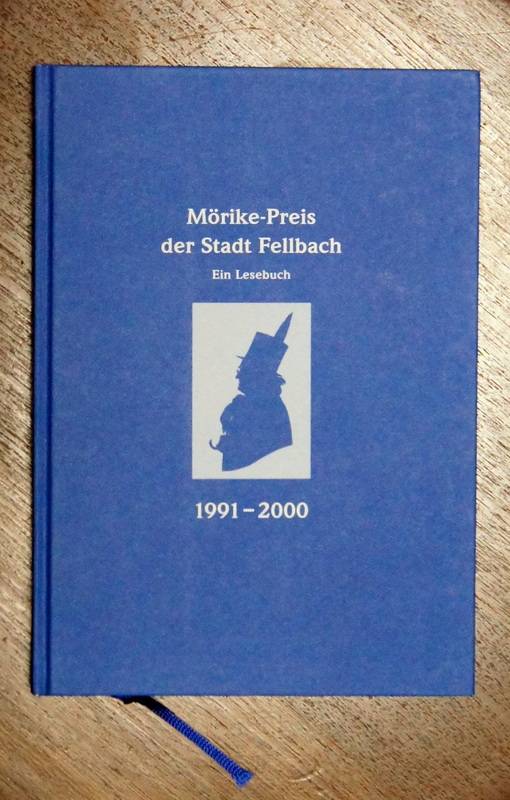 In 2000, a commemorative volume was published celebrating the previous decade’s winners: Mörike-Preis der Stadt Fellbach 1991-2000: Ein Lesebuch (Fellbach: Stadt Fellbach, 2000). The section on Sebald is rather extensive and runs to 47 pages. It opens with the speech (and poem!) given by the mayor of Fellbach and is followed by Sigrid Löffler’s address on Sebald. 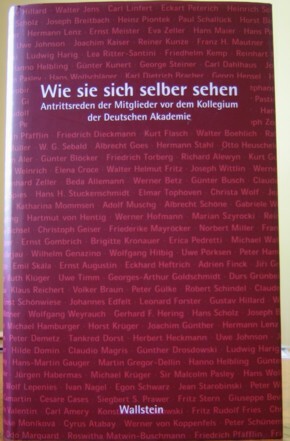 The volume includes the text of Sebald’s acceptance speech, which he dedicated to the namesake of the prize, the German Romantic poet Eduard Friedrich Mörike (1804-1875): Was ich traure ich nicht – Kleines Andenken an Mörike and an excerpt from Die Ausgewanderten. During the same year, Wolfgang Schlüter, an essayist and music historian, was awarded a Förderpreis and the text of Sebald’s Laudatio auf Wolfgang Schlüter is also included. 1998. Los Angeles Times Book Award. 1999. Prix du Meilleur livre étranger. (France) for The Rings of Saturn. 2000. Joseph Breitbach Preis. Sebald was one of three winners of the 2000 prize. 2000. Heinrich Heine Preis der Stadt Düsseldorf. Sebald was awarded the sole prize for the year 2000. The commemorative booklet Verleihung Des Heine-Preis 2000 Der Landeshauptstadt Dusseldorf an W.G. 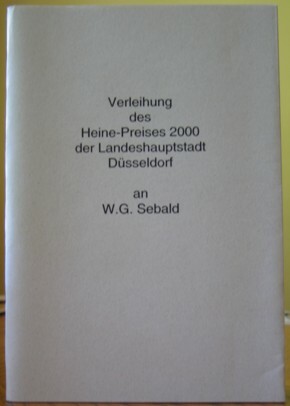 Sebald (Dusseldorf: XIM Virgines, 2000) contains the laudatory speech Melancholie als Widerstand by Irene Heidelberger-Leonard (scholar and editor of Jean Améry’s works) and Sebald’s speech entitled Die Alpen im Meer – ein Reisebild. 2001. National Book Critics Circle Award. For Austerlitz. 2002. Independent Foreign Literature Prize. In 2002, the British newspaper The Independent posthumously recognized Sebald for Austerlitz. Sebald’s friend and colleague, Gordon Turner, Professor Emeritus of German at the University of East Anglia, accepted the award on behalf of Sebald’s widow, Ute. 2002. Literaturpreis der Stadt Bremen. Posthumously for Austerlitz.